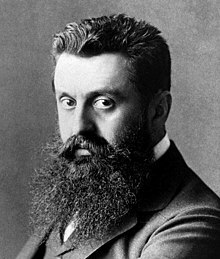 Theodor Herzl (Ebreu: בִּנְיָמִין זֶאֶב הֵרצְל‎‎, Hungarian: Herzl Tivadar, Serbie: Теодор Херцл; Teodor Hercl); Mey 2, 1860 – Julie 3, 1904), born Benjamin Ze’ev Herzl, an aa kent as חוֹזֶה הַמְדִינָה, Hozeh HaMedinah, lit. "Veesionary o the State" wis an Austro-Hungarian jurnalist an the faither o modren poleetical Zionism an in effect the State o Israel. Wikimedia Commons haes media relatit tae Theodor Herzl. This page wis last eeditit on 7 Mairch 2018, at 20:00.